So, on Saturday I returned to Konya to see a 'sema' - a 'whirling dervish' ceremony. A dervish is a Sufi Muslim who uses acute poverty and abstinence together with meditation as a path to knowing God. In this he is similar to the Hindu sadhus of India and to certain types of Christian monks (Franciscans or Dominicans, for example). Mevlana Celaleddin-i Rumi was a celebrated 13th Century Islamic scholar who was born in Afghanistan but fled the marauding Mongols and finished his life in Konya. 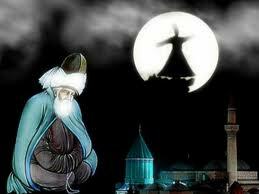 Whilst there he was much influenced by a dervish known as Tebrizi. Incredibly, it seems that Tebrizi was murdered by students of Mevlana who were jealous of his special place in Mevlana's heart. After Tebrizi's death a deeply shocked and saddened Mevlana withdrew from the world to meditate and write his poetic masterpiece on love and tolerance, "Mesnevi". Later, legend has it that Mevlana was walking in the marketplace when he heard the rhythmic beating and chanting of gold workers. He was so transported by this he held out his arms and started to twirl around in ecstasy. Thus, the whirling dervish was born. The setting for the performance was a brand new cultural centre specially built to purpose. It reminded me a little of the sumo wrestling arena (Ryoguko Kokugikan) in Tokyo, with its seating area surrounding a sacred circle. There was no admission (a first in Turkey for me!) and the place was soon packed out. I had to laugh when this guy sat directly in front of me. Get in! Even Sufi mystics support The Reds! The performance lasted 90 minutes and started with a 15 minute wailing session that immediately tested the crowd's patience. There then followed a sermon in Turkish that seemed to go on forever, although my watch told me it only lasted 20 minutes. The crowd was definitely getting restless by this point. After that 25 dervishes entered the arena and sat around the edge of the circle on goatskins. The crowd perked up and thousands of photos were taken. The dervish clothing is interesting. Their idiosyncratic hats symbolise gravestones, their black cloaks represent the darkness of a tomb and their white whirling undergarments represent shrouds. The death represented is an "ego death" rather than a physical one. Their appearance occasioned some slow, hypnotic music, some drumming and more wailing. The crowd sagged and lost interest again. This culminated in all of them casting off their black cloaks & being symbolically reborn in union with God. Finally, they queued up and as they passed that important point in the arena they commenced to whirl. The whirling surprised me. I had imagined it to be a form of synchronised dance, but it was nothing like that. The only rules seem to be that the whirling must be anti-clockwise, must be centred around the heart and the right hand should be palm up towards heaven and the left should be palm down towards earth. The rest is up to the dervish and how he feels at the time. Some whirled quickly, some slowly, Some moved across the floor a lot, others remained almost stationary. After 15 minutes of whirling (during which time nobody fell over or careened wildly into a neighbour) they took a 5 minute break, and then they were off again. The crowd went wild for about 2 minutes then got bored and started to leave in droves. I couldn't believe it - by the end of the first whirling session about 80% of the audience had gone home! It was disrespect on a truly massive scale and unlike anything I've ever witnessed before. I was really embarassed and I wasn't even one of the ones leaving.